Relationships hold your attention, and situations that have been stuck head toward crisis. This is the perfect time to break away and head into new territory, even if you’re only changing your attitudes or habits. Stress can rob your vitality unless you concentrate on releasing it. Meditation can be helpful, but you’11 also gain by staying active. Schedule a massage on February 1, 12, and 25, to aid your need to let go of tension. Partnership and marriage show signs of strain, and the solar eclipse on February 16 draws your attention to issues that must be addressed if you are to maintain a positive outlook on your relationship. 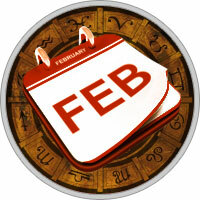 If you’re single, you may meet someone new after February 15; at least the field of choices improves! Your needs for intimacy grow strong after February 13, and if you’ve been holding back, it’s time to trust your feelings and let your heart lead the way. Joint finances are promising, and an investor or business partner can bail you out of financial difficulties. But you may also be the one caught in the grip of tax or debt problems from February 4 to 9 if a partner has failed to meet his or her obligations. (These are also not good days to sign partnership agreements.) Research and investigation are promising from February 9 to 28, although you may not like what you uncover. This is a great time to work with a counselor or therapist to dig into unresolved issues or get in touch with your deeper feelings.